RIO DE JANEIRO — Gold-medalist American swimmer causes international uproar with late-night antics, angers foreign government and embarrasses USA Swimming. The story of 2016? It is now, thanks to Ryan Lochte. But it’s also a story from the 1988 Summer Olympics in Seoul, South Korea. The story is eerily similar to the one making headlines now. The swimmers were partying after their last night of competing, they saw a decoration on a wall in a hotel, they decided to take it, they left the premises, someone noticed and followed them and a confrontation took place. The pair spent more than seven hours at two police stations, and the United States Olympic Committee ordered both out of the host nation as soon as local authorities would permit. Many Koreans wanted the swimmers to be restricted from leaving. A double gold-medal performance in the pool had morphed into a nightmare. “It damaged my reputation irrevocably,” Dalbey said Thursday night from his home in Arizona. He was 20 then, and he is 47 now. He was suspended for two years (later reduced to 18 months) and it altered his love for the sport of swimming. He has three children now, and he’s had to explain to them what he did 28 years ago. After this week’s headlines, he’ll probably have to explain it again. But his main thought was for the other three swimmers, around the age that he was, acting foolishly after their last night swimming, and having no idea what’s coming next. What nags at Dalbey (and many, many others) isn’t the mistake, but the seeming cover-up. He displaced property, like Lochte and the others allegedly did, but he owned his behavior. Lochte had the chance to own it, and he apparently didn’t. Throughout Thursday night’s interview, Dalbey kept coming back to the younger swimmers. Lochte is likely done with the sport, at least at the elite level, but the others are not. It took Dalbey a long time to love swimming again, he said. He’s now an executive in a solar power company, and doing well. Coaching the sport brought him back to a place where he could appreciate being in the water like he did before he erred. 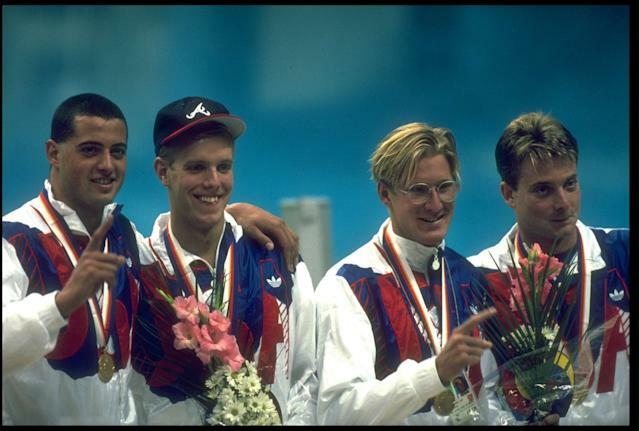 (Gjertsen also went into coaching and is now in the Georgia Aquatic Hall of Fame.) Dalbey still has his gold medals, but they are locked away and he hasn’t looked at them for a while. What it was: a reckless mistake made in the euphoria of glory, which he fortunately didn’t make worse by lying. What it is: a bad memory and a good lesson. Good advice for Ryan Lochte, from someone who knows.